JOHANNESBURG, South Africa, November 26, 2014 – “The world’s future food basket” is Africa. By 2030 the continent needs to become food and nutrition secure, as well as a global scientific player. Africa possesses 60% of the world’s arable land and 70% of its water as well as human capital. These are elements for successful production, but is Africa lacking in technology and mechanized systems to fully gain momentum as a global producer and supplier? It is for these answers that over 570 delegates from across the globe have gathered in Johannesburg this week for the ‘Celebrating FARA’ event being held from 26 – 28 November. 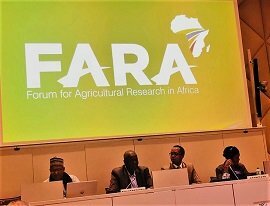 “The role of science in enhancing agricultural productivity, competitiveness and market access in Africa is too important for it to be outsourced,” says Dr Yemi Akinbamijo executive director of the Forum for Agricultural Research in Africa (FARA). This week, (FARA) has brought together key industry players to review the progress made at country, sub-regional and continental levels. Lessons will be drawn from milestones reached and discussions will be held to come up with solutions that will set the strategy for delivering Africa’s future over the next decade through science led agricultural transformation. Some of the world’s top opinion leaders in Agriculture in Africa will be presenting over the 3-day period including Prof. Calestous Juma, Professor at Harvard Kennedy School and Visiting Professor at MIT (2014-2015), an internationally recognized authority on the application of science and technology to sustainable development. He was named one of the most influential 100 Africans in 2012 and 2013 by the New African magazine. His keynote address amongst the impressive list of guest speakers will be: Smart Harvest: the role of science, technology and innovation advice in African Agriculture. Other discussions will include climate change, food sovereignty vs. food security and a focus on the promotion of youth engagement with the creation of the Youth Agripreneur Model. “Without the catalytic role of a science agenda, the transformation dream will only be a mirage” says Dr Akinbamijo. No nation has achieved social and economic growth without using the power of science. Africa needs to use science and technology to leverage more value out of the resources available on the continent and African leaders will have to invest more of their own resources in this area. “Being able to demonstrate the power of science to support agriculture and development is at the heart of this FARA event. This is particularly important when you consider that 75% of the Africa population depends largely on agriculture. FARA has been a game changer for 15 years and is altering the landscape of African agricultural development in order to reach the target for 2030 to become the majority supplier for food security across the globe. Its transformative agenda impacts on economic transformation and inclusive growth. FARAs work will create the monumental shift from Africa being an importer of food to the importance of becoming an exporter.